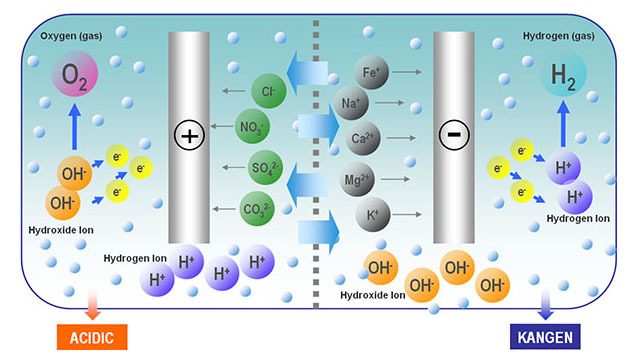 The fact is that the technology of producing hydrogen water is based on the electrolysis of water. Molecules of water (not all of courseare separated by electric current to H + and OH-. H + are attached to the cathode, and then form the compound H2-gas hydrogen. It has therapeutic and antioxidant properties. It makes water saturated with hydrogen, which means water receives an antioxidant properties. In the case of acidic water, it has more oxidants that can destroy the bacterial membranes, so dead water has disinfection properties and used for external use. вода лучше получается без соляного раствора. Это субъективно или может быть так? Ты поддерживаешь уровень раствора в колбе? Витя, соль нужна для производства сильнощелочной воды 11.5 Для обычной питьевой воды соль из бокового контейнера не используется. Благодаря этой соли вода 11.5 и вода 2.5 получаются эффективными.